The Court of Appeal today ruled that MP Geetha Kumarasinghe was disqualified to be a Member of Parliament as she holds dual citizenship. The Attorney General had earlier informed the Court of Appeal that MP Geetha Kumarasinghe was still a citizen of Switzerland and according to the 19th Amendment to the Constitution, a person who has dual citizenship cannot be an MP. 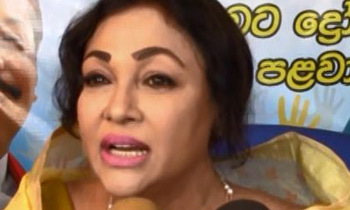 Deputy Solicitor General Janak De Silva had informed Court that, according to clause 91(1) of the Constitution, she was not entitled to Parliamentary privileges and could not be a Member of Parliament. Now need to recoup all the money and benefits she received funded by the taxpayer!!! what about others in american citizen holders ? Now she qualifies to be appointed Defence 'Secretary'. It will an 'loud' affair. Arjun Mahendran is not a citizen of Sri Lanka. He is Singaporean. So, can he rob Central Bank? can he hold Big Boss post of the Central Bank? Not as a defense secretary, position most suit for her a chief accountant in the Gov. treasury department. Law should be equal to all and the other members what ever party they may be should gracefully hand over there positions. Or else the law has to be equally changed for all. Run to Appachchi, he might be able to do something about it in say, another 20 years or so!!! Now pay back time for all the money and perks you received as a MP. Don't be so naive. There will always be a way around. HAVE THEY IDENTIFIED ONLY GEETHA ??? What I can't understand is this British system!. The same law studied by same Judges (Appeals and Surpreme) can interpret the law? This is why this appeal system exists. If Supreme court nullifies the ruling, the judges of Appeal court will look fools. Just unimaginable why these archaic systems still exist in our country. I agree that government appointments should not be given to dual citizenship holders as well.